Commission for SesameBun, from Furaffinity. They are Tavi and Sesame in their human form. And you, viewers, are like that red bird in the window, witnessed a cute scene. Tavi has a tiger-chipmunk's pajama and Sesame a bunny's. 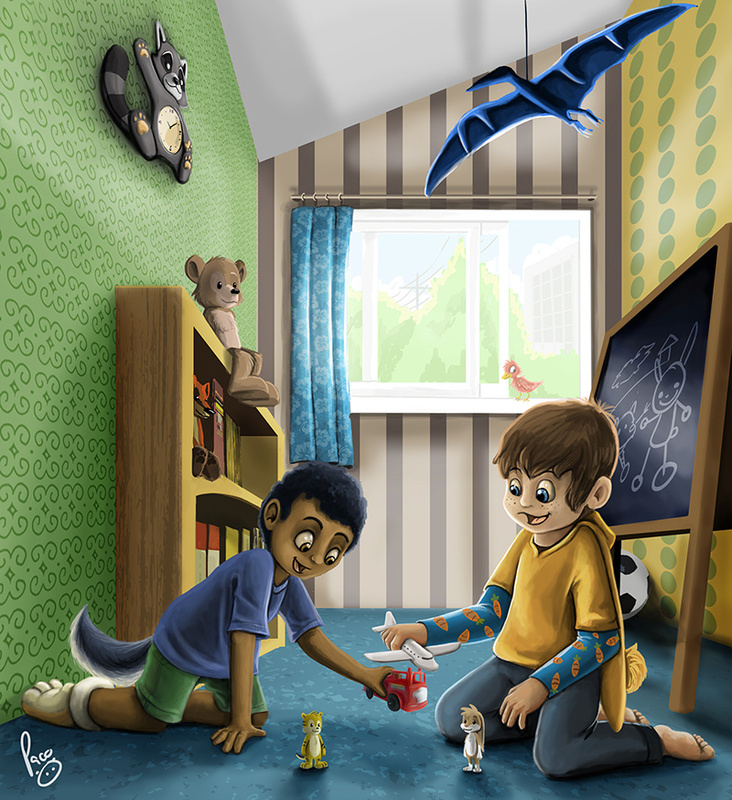 You can realize many stuffs in the picture, as the toys in the floor, that are their own fursonas, also they are in the blackboard drawn. I would love to have a raccoon clock as that one in the wall. They also have the bear-sitter robot!! A pterodactyl is in hanged in the ceiling cuz my little bro used to love dinosaurs and all the prehistoric animals. This is wonderful on all levels. Adorable.. totally love the bunny hoodie too! Flying firetruck force go! WOOooOOooOOoo! Flying firetruck force go! WOOooOOooOOoo! hehe, very cutesie. yeh, hehe, I know, it is the flying firetruck vs the airplane, in the kid's playgames everything can happen. Its cute, but I want xray-glasses. I originally wasn't too excited when I saw human boys, but after looking at it in more detail, I really love the way you communicated their fursonas in so many different forms, whether the toys, the clothes, the accessories, or the drawings. I especially like the bunny hood with the long ears! XD Very cute work, and creative, too! It is complicated that someone ask me for some human art, because I'm in the furry fandom rounded furries, hehe, and also I love drawing furries and animals, but it is not mean that I don't like drawing and painting humans, but it was really exciting to me when a furry guy asked me for drawing their fursonas in human form, was fun to me. And of course, giving them details that make to see which are those characters in the fandom. I love the hoodie too, I want one like that. Also I really want that bear that is in the bookseller.